Mom. Wife. Personal Trainer. Marathon Runner. Fitness & Health Advocate. After reading Jessica Waytashek’s ten-word Twitter description, it’s hard to believe that she could fit anything more into her busy life. But she’s also a student in the University of Wisconsin Health and Wellness Management program, set to earn her bachelor’s degree this spring. What’s even more impressive is that Jessica has already landed a job as the health and wellness coordinator for Mills Fleet Farm. She was originally hired as a benefits specialist, but the company created a new position for her last May after considering her interests and soon-to-be degree. At the moment, she is designing a corporate wellness program, which includes health risk assessments and biometric screenings. Two years ago, she became a personal trainer. She runs marathons—so far ten half and two full ones—and starting this spring, will pace marathons for the Minnesota Pacers team. She is a busy woman. Together with her husband, she raises three boys, ages 16, 10, and 3. 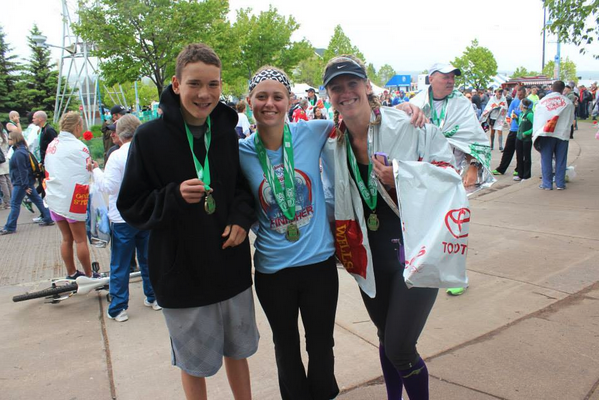 Jessica, right, with family at the finish line. The program was exactly what she was looking for. Jessica says she would not have been able to earn the degree she wanted in Brainerd, Minnesota. No brick-and-mortar schools in the area offered a health and wellness program, and moving to the Twin Cities was out of the question. With strong commitments to both work and family, the big draw of the UW Health and Wellness Management program was that it is completely online. For Jessica, two things stand out as her favorite parts of the UW program. Assignments, like the instruction, are online. Some are essays, some are multiple choice, and some are group presentations. Though they may seem odd in an online program, group projects are the most helpful assignments, Jessica says. The wellness program at Mills Fleet Farm is still in its early stages. Employees can participate in health events to earn a discount on their health insurance. Jessica plans wellness challenges to keep them engaged, with incentives such as free Fitbit activity trackers. Getting people to join and stay engaged can be tough. One of the most useful things she has learned in the UW Health and Wellness Management program is about behavior change. One woman in the program has lost 37 pounds. For her, the program provides focus and accountability, especially when logging meals. “Having someone there for encouragement has helped her make positive changes in her life,” says Jessica. Seeing these small but important victories is what Jessica loves. To her, building a corporate wellness program is not just a job—it’s a passion. To find out more about how you can pursue your dream job, visit the UW Health and Wellness Management website. I think it’s awesome that eating better and working out changed her life. I have a few employees that could definitely benefit from that. It’d be great if I could implement a corporate wellness program. Would you recommend it? Hi Mia! Thanks for your comment. We think Jessica is awesome as well! Congratulations and good luck in your project!! It’s a beautiful idea. Good luck with your project. This is very inspiring! We really need to be motivated for this wellness program to workout. Congratulations!